There is something amazing about how desperately humans want to see who has viewed their online profiles. This desire has been taken advantage of (again) by Twitter spammers as tweets like “WOW! You can see WHO VISITS your TWITTER profile. That’s cool! :) – http://bit.ly/tweetviewer” and “I just viewed my TOP20 Profile STALKERS. I can’t believe my EX is still checking me every day” are proliferating this morning, at about 159 tweets a minute. The “See Who Viewed Your Profile” application preys upon this exact curiosity, asking users for Twitter oAuth, and then using that authorization to tweet out the above. And while it’s not clear that it’s doing anything behind the scenes, at the moment it is definitely using the access granted to spread itself. Once again: Don’t click on any http://bit.ly/tweetviewer links, and if you do, immediately revoke the application’s access to your account by going to Settings > Connections > Revoke Access. Twitter’s Head of Trust and Safety Del Harvey recommends the same, here. Update: Bit.ly has blocked the domains hosting the links, but as long as the app has Twitter permissions it continue to spread with a new short link. 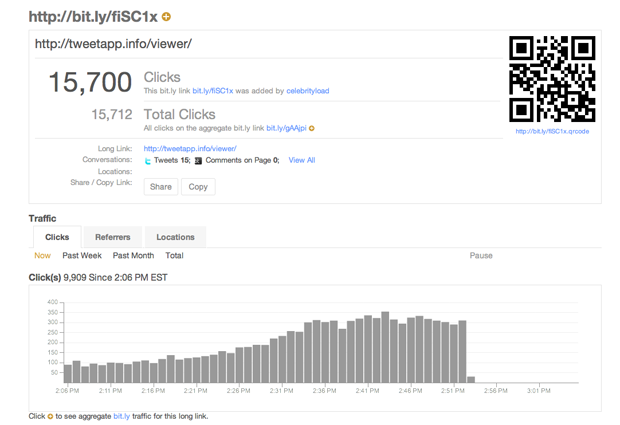 Here are the Bit.ly stats of the original link’s trajectory.